Trump says he will go ahead with plan to send migrants to sanctuary cities. This is going to be comedy gold. If barky was able to do this with all the “Syrian” refugees, President Trump has the legal authority to do so as well. Open border fools, here you go, put your damn money where your mouths are. What. The politicians there promised the voters that all illegal immigrants would be welcome there. I’m sure that’s why the voters elected them. Now they are reneging on their campaign promises. The “undocumented” have come home to roost. Don’t think this won’t backfire. 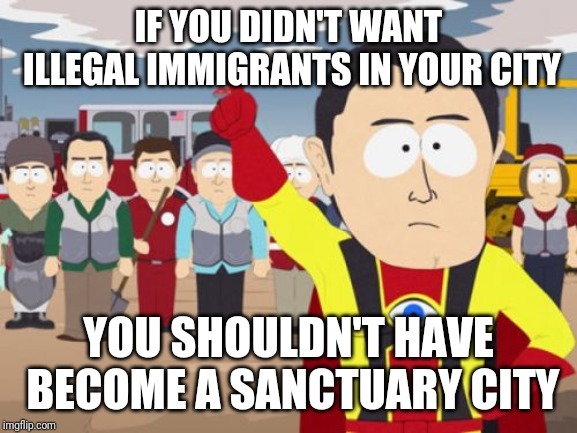 I’m sure all these sanctuary cities/states have buses at the ready on which they’ll load illegals and send them to other parts of the country. I wish Trump would just tell all the judges to go to hell, round up all the illegals and ship them back across the border–about 100 miles into Mexico. I don’t give a damn about judges’ decisions when our country is in peril, and it is they, not Trump, who are breaking the laws of our Constitution. Let the left go to hell where they were conceived, born, and are bent on bringing the rest of us. I can hardly wait. I know it’s just a fantasy that a couple busloads would stop at the end of Nancy Pelosi’s driveway and unload, but hey, let me enjoy my dreams.